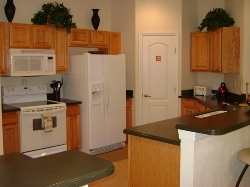 Power Villa 2 Rent is our beautifully appointed home located just minutes to Walt Disney World and all of Orlando's premiere attractions! 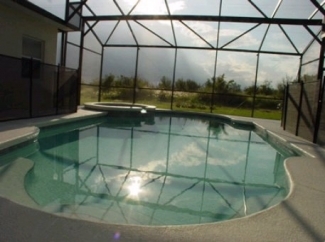 This stunning 4 bedroom / 4 bathroom pool home is sure to meet and exceed all of your expectations and dreams during your next stay. We are sure you will find our villa has everything you will need for the perfect holiday. Situated on the highest point in the area with views of Disney's nightly firework display, this gated community of Executive only villas has a palm lined boulevard. 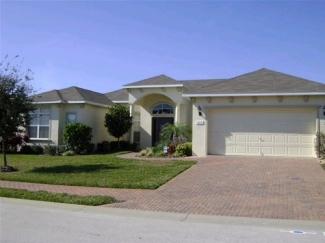 This home is a uniquely designed H shaped Executive Florida villa with two master bedrooms, each with King-size bed, walk-in wardrobes, televisions, patio doors leading onto the pool deck, and ensuite bathrooms with twin vanity units, large shower cubicle, and roman tub. 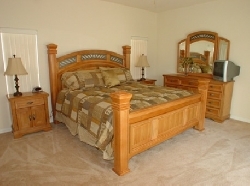 The third bedroom has twin beds and an ensuite bathroom with bath and shower over. 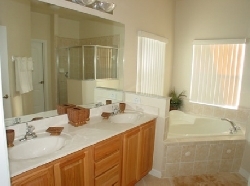 This bathroom is also accessible from the pool deck. 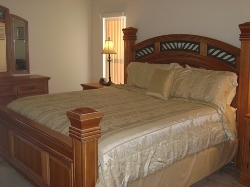 The fourth bedroom also has twin beds and has an ensuite bathroom with bath and shower over. A luxury fully equipped kitchen with breakfast bar adjoins the dining room overlooking the pool deck. 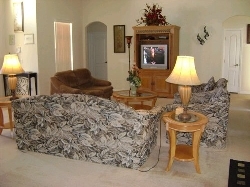 A large living room, almost 25 ft x 19 ft, with television, patio doors opens onto the covered lanai which is ideal for alfresco dining overlooking the free-form swimming pool and jacuzzi. 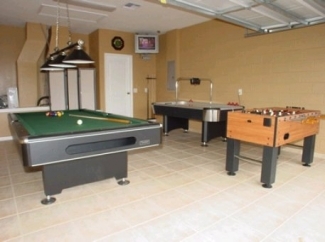 All bedrooms, the living room, and covered lanai have ceiling fans.This home offers a games room with pool table, air hockey table, foosball table, flat screen television with DVD. A wall at the rear provides privacy. 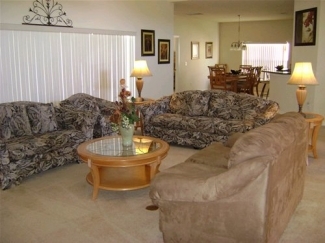 The Manor at West Haven also provides a tennis court and childrens recreational area and cabana. 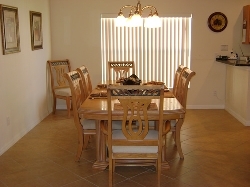 This villa provides easy access to all the theme parks, malls, restaurants and shops on either Interstate 4, Highway 27 or US192, and is just one mile from Championsgate with the Omni Hotel with 5 restaurants, two 18 hole Greg Norman designed golf courses, a David Leadbetter Golfing Academy, and an up-market shopping plaza with a Publix supermarket, shops, and several restaurants including American, French, Italian, and Mexican cuisine. There are many superb golf courses within 10 miles including Championsgate with two Greg Norman designed courses, Reunion with three courses designed by Tom Watson, Arnold Palmer, and Jack Nicholas, Highland Reserve, Providence, Southern Dunes, Orange Lake, Diamond Back, and Falcon's Fire to name just a few. This is a popular villa in a quiet location yet within easy reach of the main attractions, including Disney, Universal Studios, and SeaWorld, and also a wide choice of dining options, shops, and malls. Within easy reach by way of Interstate 4 to the east are Tampa, Busch Gardens, and the white sand beaches of the Gulf Coast, whilst to the west lie Kennedy Space Center, Daytona, Cocoa Beach and the Atlantic Coast. Free Phone calls to landlines only UK, AMERICA, CANADA+ many more countries. Please note that the rates shown do not include 13% tax.